Lately, Gearbox has been giving us a whole lot of nothing! By that we mean nothing concrete. All we know is that on March 28th they will be hosting their panel at PAX East and they got some announcements to make. Just in the past week or so, Gearbox has teased us with Borderlands 3 a couple of times and a mystery game. They have all come with the caption “Time to tease another game for PAX!” With ten days left until the panel, what will Gearbox tease next? Because at this rate, there is bound to be more. The new tease came about on Gearbox’s Facebook page earlier today. The image features Ishi Sato from Bulletstorm and Duke Nukem from Duke Nukem. It appears to be Duke showing Ishi a cool device on his wrist. It looks kind of like a base for a hologram in a kind of “Help me, Obi Wan Kenobi. You’re my only hope” kind of way. What does this tell us? Who knows? 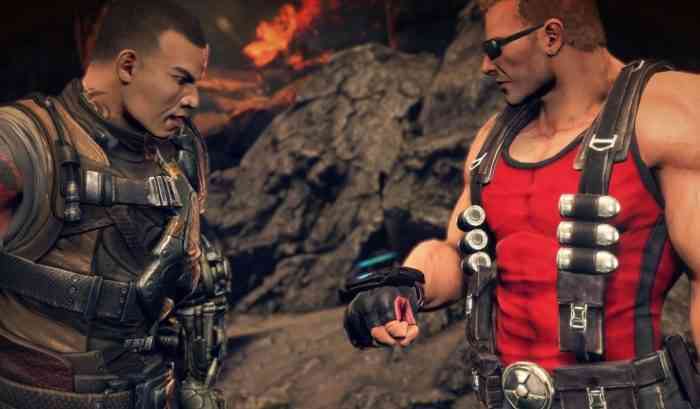 The Bulletstorm: Full Clip Edition gave players access to a Duke Nukem themed piece of DLC. In this DLC, fans could play as Duke with lines recorded by Jon St. John and everything. This image could be a hint at a re-release of that game. What would be even cooler is a follow-up to it, or a crossover of Gearbox titles. The games themselves are pretty crazy, which would lend itself to each other quite well. But that’s just speculation. For sure, we’ll have to wait until PAX East for all the pieces to come together. What do you think this image is trying to tell us? Let us know in the comments below.